Now a week since the Washington Capitals captured their first Stanley Cup in 43 seasons since joining the National Hockey League, it’s time to look at the masked man in the crease who led them there, Braden Holtby. 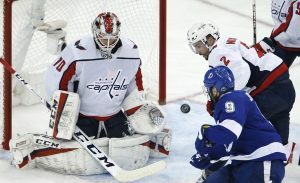 In the Caps’ Stanley Cup-winning season, Holtby performed as well as he ever has in the playoffs, leading his team to a championship many counted them out of this season. After finishing what can now only be called the best season of his career, let’s take a look at how Holtby was snubbed of a shot at another Vezina Trophy. Braden Holtby put up the worst numbers of his NHL career in the 2017-18 season, posting a 2.99 GAA and .907 SV%. 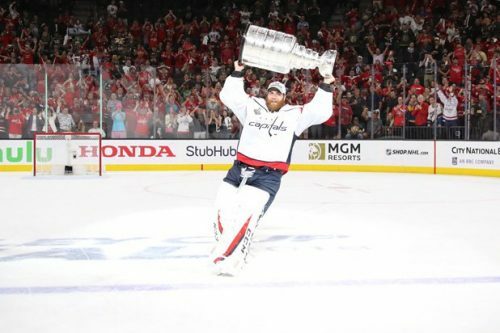 Albeit considerably poor numbers, Holtby still managed to win 34 of his 54 starts in net for the Caps and led them to another Metropolitan Division championship. Because of his poor play, Holtby had a rough ending to the regular season, losing out on most of the starts to close the year to backup goalie Philipp Grubauer. To add insult to injury, Holtby was benched in favor of Grubauer for the first 2 games of the Stanley Cup Playoffs against the Columbus Blue Jackets, wherein the Caps lost both games. After going down 0-2, Head Coach Barry Trotz decided it was time to hand the reins back to Holtby, and he was more than right to do so. Holtby led Washington from the crease to 4 straight wins and a series win against Columbus, and earned his team a third-straight meeting with the Pittsburgh Penguins. After two years in a row of losing to the Penguins and seeing them go on to win a pair of Stanley Cups, Holtby and the Caps were not going to let that happen again. Ultimately, Washington would oust the Pens in 6 games, and face the Tampa Bay Lightning in the Eastern Conference Final. Washington went on to win that series in 7 games, on the road, to boot. In the Stanley Cup Final, Braden Holtby and the Washington Capitals were set to face a familiar foe on an unfamiliar squad, that foe being Marc-Andre Fleury and his new team, the expansion Vegas Golden Knights. Fleury was part of the Penguins team that so handily sealed Washington’s fate year after year, and posed possibly the biggest threat to the Caps to date. However, as play ensued and the series got underway, Holtby remained unfazed and continued his exceptional play. The Capitals would lose Game 1 to the Golden Knights after blowing a lead, with Holtby allowing 5 goals. However, from that point on, the Caps turned it on, and Vegas was as good as done. Washington would win all remaining games to take the series, and the Stanley Cup, 4-1. In those games, Holtby allowed more than 2 goals only once, in Game 5. He had above a .930 SV% in 3 of the 5 games that series and 2018 playoffs numbers of 16-7, a 2.16 GAA, .922 SV%, and 2 shutouts. 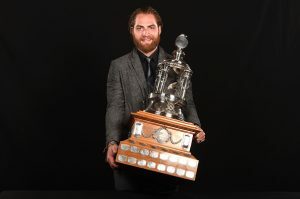 Now that Holtby finally won the most lucrative piece of hardware for any NHL player, it’s strange that he isn’t part of the Vezina Trophy conversation for the league’s best goaltender. This brings about an argument as to why the league nominates players for trophies before the Stanley Cup Playoffs, and whether or not that’s the right thing to do. The three goaltenders nominated for the 2018 Vezina Trophy are Pekka Rinne, Connor Hellebuyck, and Andrei Vasilevskiy. All excellent goalies in their own right, each of them fell short of the ultimate goal this year, which of course was to win the Stanley Cup. It makes sense to reward regular season success, but to a point. If the league had waited to see Holtby turn his season around and win a Cup, he very well would have earned his nod and won the Vezina Trophy– again. This isn’t to say that every goalie who wins the Cup would win the Vezina as well. Take Antti Niemi, goalie for the 2010 Stanley Cup Champion Chicago Blackhawks, for example. He had a notably poor postseason performance, but was saved by goal support. Just because a goalie wins the Cup doesn’t mean they would win the Vezina in turn. But, in a case like that of Holtby this year, he probably deserves better than a snub in favor of one of the other nominees. At the end of the day, Braden Holtby already has a Vezina Trophy to his name, and was able to capture a much more meaningful trophy this season, the Stanley Cup. He’s probably the last person complaining about not being nominated. But, for the sake of discussion, it’s good to open the channels for talking about changing the format and structure of some of the league’e traditions, such as choosing trophy nominees.